When I lived in student housing in Cambridge in 2005, I lived with a really lovely, cute couple. They were from Australia. The guy was studying a PhD at Cambridge. I forget which discipline, it may have been maths. They both loved nature. We watched a lot of nature programmes together – Blue Planet was a favourite. They were really sweet – they loved being together, loved messing around together and had a slightly sickening way of planting tiny little kisses all over each other’s faces. The girl liked to confuse me by telling me things like when she’d bought used pants at a thrift store. Which I thought rather disgusting until I realised she meant used trousers from a charity shop. They were also Lutherans. Watching the wonder of the beautiful oceans and seas of the planet we live on and the majesty of the creatures who reside within them, they regularly exclaimed at the wonder of God’s creation: “isn’t God amazing”. And that made me sad. Sad that the gobsmacking, fantastic reality of the earth was being assigned to a being I believe does not exist. It felt almost diminishing. Derogatory to reality. It made me feel they were actually missing out on how amazing evolution is. How astonishing and *awesome* (I should stop overusing that word) the lives we and all the other living denizens of the world have. On Saturday I was at a tutorial for the Level 2 OU module on Human Biology. We were learning about the human digestive system and how it functions. Although I do remember a lot from GCSE Science, some of it was definitely new to me. At one point something became clear – evolution (and what it has achieved in developing a system that stops enzymes destroying us from the inside out) – is incredible. And this brings me to my point. I was in Crawley, West Sussex having my tutorial but I would have loved to be in Brighton as well. Luckily where I wanted to be was filmed. 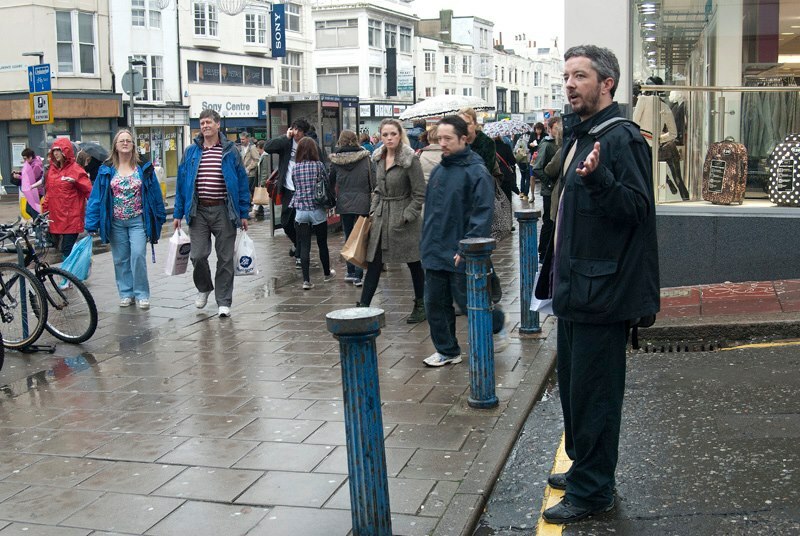 The film below is of my friend Simon Clare on the street, in Brighton, preaching. But he wasn’t preaching the word of a god. He was preaching about how life is good (without God) and he wants you to do it too. If you look out into the night sky, you can see vast numbers of gigantic objects. Beautiful stars, all going about their spectacularly huge, significant business. Stars may be huge, really really huge but they are dead. They don’t even know they are there. They really are just mere matter. If you could ask all their component atoms where they would rather be, they would, I believe choose to be in a living creature than in a dead star. If you take all the atoms in the entire universe and look at where they end up, you will see that the proportion that end up in a sentient brain is tiny. The proportion that end up in human brains is even smaller. The rarest and most valuable thing this universe has to offer any of its atoms is one lifetime of consciousness. One life. Just by simply being alive, we are jackpot winners in a cosmic lottery. Every atom in the universe enters this lottery and the winning atoms are the ones that are here, inside our heads. Life is finite but for me that only adds to its value. I love humans but surely only humans could win the greatest prize in the known universe and then hope there’s more, and that life might be eternal. We’ve already won! At Guildford Skeptics, in October, after Simon’s talk on An Atheist’s Guide to the Alpha Course, someone asked whether they thought it was our place to try and convert people. My view on that is, if their religion is doing them no harm and doing no one else any harm, we should not seek to rip their belief and faith from them. It may, in some cases, be harmful and unethical to try to do this. My 80+ year old grandmother is a staunch believer in Christ and his teachings and she finds what she perceives as His love gives her strength where she needs it. I would never have told the Lutheran couple how annoying I found their proclamations of admiration of God (not least because I wasn’t quite as outspoken at 21). It wasn’t my place to say, but we did have some good conversations… and some awkward ones. As Simon says in his talk, you could say that the strength people of faith enjoy is their own personal strength – not something that comes from an external, omnipotent force. But you may be wrong. That strength may not have been there if it weren’t for their faith. With nothing to replace someone’s faith, we may not, as atheists and/or humanists, be able to substitute faith and belief with something else. Someone who has lost their faith may have to go through a grieving process. This is something I’ve heard many who’ve lost their faith say. However, there *is* a great joy and wonder about a life without faith. I can’t say I have ever truly believed and I do feel privileged in that. I’ve lived a life where I found joy in joy alone – wonder in wonderous things without assigning their existence to a creator. I find inspiration in my friends and family and love and respect for principles and values I have had instilled in me from my own, personal creators: Mr and Mrs Pendegrass. I have to say Simon’s words fill me with hope and admiration for the world we live in – I firmly believe in secularism and that means respect for others’ beliefs where they do not impinge on others. But I do believe that religion can be and is harmful in many ways and holds a privileged status in everyday life in Britain and, to a much greater extent, in countries around the world where people are killed, maimed and tortured for their beliefs and for who they are. A life without God is every bit as fulfilling and wonderous – if not more – than a life with God. That’s why I will be following Simon’s example and plan to do my own atheist street preaching, perhaps in Guildford, where I run my group. I hope you feel as inspired as I did.